Getting relief from headaches, low-back pain and muscle soreness is easy with Pressure Point Therapy Packs. 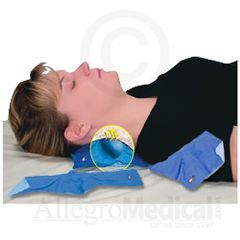 These packs use a unique combination of pressure point therapy and cold therapy to help relieve your headaches and pain. Linked therapy balls, encased in a cold therapy gel, are ergonomically positioned to fit pressure points at the base of the skull or lower back. Packs can be used at room temperature or cooled to help with headaches. The Dual Comfort cover offers both slow-release and rapid-release treatment surfaces. The cold gel is non-toxic and biodegradable. Store the packs in the freezer for convenience. Custom printing available on rapid release side. Call for details.